When Charles was born, on December 18, 1707, his parents thought he was dead because he neither cried nor opened his eyes. He was several weeks premature, so they wrapped him in wool until the day he should have been delivered. He eventually came around and apparently had a healthy childhood. His parents lost eight or nine other children in infancy. The Wesley brothers never hitched a ride from college—they walked the 150 miles to Epworth instead. The journey was often marred by bad roads, inclement weather, and even highwaymen. To make matters worse, the brothers read books while they walked. The trip scared their father so badly that he once told them, “I should be so pleased to see ye here this spring, if it was not upon the hard conditions of your walking hither.” John maintained that reading for 10 of his 25 daily miles never caused any harm. The curmudgeonly Samuel Johnson (1709 –1784) had mixed feelings about the Wesleys. 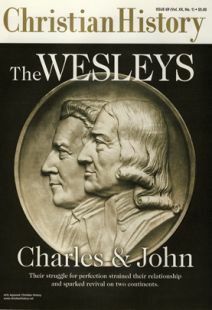 He knew John at Oxford, and said of him, "John Wesley’s conversation is good, but he is never at leisure. He is always obliged to go at a certain hour. This is very disagreeable to a man who loves to fold his legs and have out his talk, as I do.” Johnson later applauded Oxford’s expulsion of six Methodist students (see page 22), which could hardly have endeared him to the movement’s founding family. Yet at the end of his life, he wanted to invite John’s brilliant but financially restricted sister Martha to live at his house. Unfortunately, Johnson died before his wish could be carried out. Though the Methodists earned early acclaim for their ministry to marginalized groups such as prisoners, orphans, and the ill, they later became so unpopular that even these doors closed to them. God be merciful to me, an unprofitable servant! John, whose mother had called him “a brand plucked out of the burning” after he was rescued from a house fire in 1709, resolved to cheat death again. Two days after he wrote the epitaph, he made himself a poultice of brimstone (sulfur), egg white, and brown paper, which immediately relieved his pain. He recovered and lived another 38 years. After increasingly severe earthquakes in England on February 8 and March 8, 1750, a self-proclaimed prophet predicted another quake in April that would destroy half of London. The city went berserk. Charles wrote 19 hymns on the subject and published a sermon called “The Cause and Cure of Earthquakes.” On the foretold night, John reported, “Places of worship were packed, especially the chapels of the Methodists.” Nothing happened.